PINEHURST, N.C. -- For any golfer considering a primary or vacation home, Pinehurst just got a lot better -- and it was already the best! The first true golf resort in this country, Pinehurst Resort is also the largest with eight 18-hole courses, anchored by the fabled No. 2. But there is a lot more to the area than just the resort. Numerous -- as in dozens of -- high quality public and private courses surround town, include several standouts such as the Donald Ross-designed Mid-Pines Inn & Golf Club and Pine Needles Resort, and the wonderful Tobacco Road Golf Club by Mike Strantz in nearby Sanford. The Village of Pinehurst itself was one of the earliest planned villages in the nation, laid out by the most famous landscape architect of all time, Frederick Law Olmsted, of New York's Central Park fame, who also designed the golf-mad town of Kohler, Wis. Since Pinehurst was developed by a Bostonian as a place to draw Northerners in the cold winter, it is done in the style of a quaint New England village, combining the best of two small-town cultures -- Southern hospitality meets Yankee charm. While its official and accurate nickname is the Home of American Golf, the more frequent description is "our St. Andrews," and this too is totally correct. Like the Scottish version, the town exudes golf and golf history. It's a living, breathing monument to the game that makes the hair on your arm stand up in anticipation the moment you arrive. There are other similarities, such as the fact that the town is located in the Sandhills region, and like the linksland of Scotland, everything is built on desirable sandy soil. As acclaimed designer and two-time Masters champ Ben Crenshaw said at the recent re-opening of No. 2, "When a young Scot named Donald Ross got here, he was very happy with what he saw, which was sand. It reminded him of home. Before long, Pinehurst became the premiere spot in golf, and it's rightfully been called the St. Andrews of the U.S."
But there is one other important similarity not many people know about. Just as St. Andrews residents get an incredible annual deal on golf in town -- such a good deal it makes moving to St. Andrews tempting -- so do the owners in Pinehurst. Originally, every single residence in town was deeded with rights to join Pinehurst Country Club, which is comprised of courses 1-7. The rules stipulated that the golf rights, which are attached to the real estate, must be maintained non-stop, so if an owner opted not to pay dues, the house lost its claim. Today, about 60 percent of residences carry the privilege, and here is what that means: buy a home, pay a one-time $12,000 transfer fee and then take whatever membership you choose, from a non-golf social at just $87 per month to a full golf for $361. Lesser memberships can be upgraded at any time. Even the priciest is less than the fees at many modest single-course clubs, and Pinehurst No. 2 is included! I spoke to a member who plays it 40 times a year, and the public greens fees for one round are higher than the highest monthly dues. 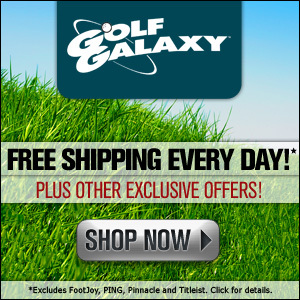 Social or recreational members get greatly discounted golf, perfect for part-time residents. Members get their own clubhouse at courses 1-5, croquet, lawn bowls, tennis, the whole nine yards, and also enjoy a great deal on the Tom Fazio-designed No. 8, the only resort course not included. So buying a home in the village with golf rights is one of the greatest hidden golf bargains on earth. 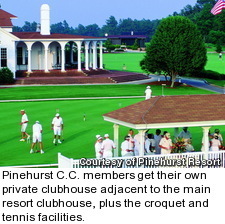 How much is Pinehurst real estate? Condos start less than $100,000, homes in the low $200,000s and more luxurious larger homes run $400,000-$600,000. At the very top of the market, it is hard to spend $2 million. Basically you get more for your money than in almost any other top golf destination, the golf is cheaper and there is more of it. So why did I say Pinehurst is better than ever? First, there is the revamped No. 2, opened in March after extensive restoration by architects Coore & Crenshaw that make it much, much better -- and it was already a consensus U.S. Top 10. The new No. 2 has to be seen to be believed, but it is easily the best public inland course in the nation. 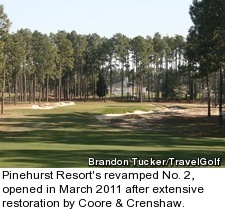 Several other Pinehurst courses, including No. 4, No. 6 and No. 7, are high quality standouts. Recently, the resort bought the nearby Pit, a beloved, local daily fee that is routed around a characteristic old mining site. They are planning to rebuild all the greens, and this may well become Pinehurst No. 9, expanding the resort's golf even further. Finally, there is one other notable new option in the area. 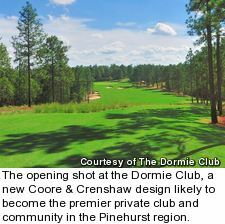 Coore & Crenshaw also just opened an original design, the Dormie Club, 4 1/2 miles from the village. A retro classic layout with deep, jagged bunkers filled with native sand, the Dormie Club is likely to immediately jump onto the Top 100 lists and is an excellent course with less than 30 current members. For the foreseeable future, the club will allow outside play and is also offering real estate on what is easily the area's best non-resort course and a clear rival to No. 2. You can take carts, but the Dormie Club was built to be walked and has a strong caddie program. The 1,028-acre site includes the Coore & Crenshaw course, and the club is also building a large practice area with a 10-hole par-3 course. There will be 159 home sites and 69 smaller cottage lots, and that is it. This is very low density, averaging 4.5 acres per resident, and the club structure guarantees no assessments after joining, an attractive feature. The first phase of both the cottage and home lots will go on sale in the second half of 2011, and the Dormie Club is likely to become one of the more desirable private clubs built in recent years -- anywhere.